If you’re local to the great Tampa Bay Area (including Clearwater, St. Petersburg and Sarasota! 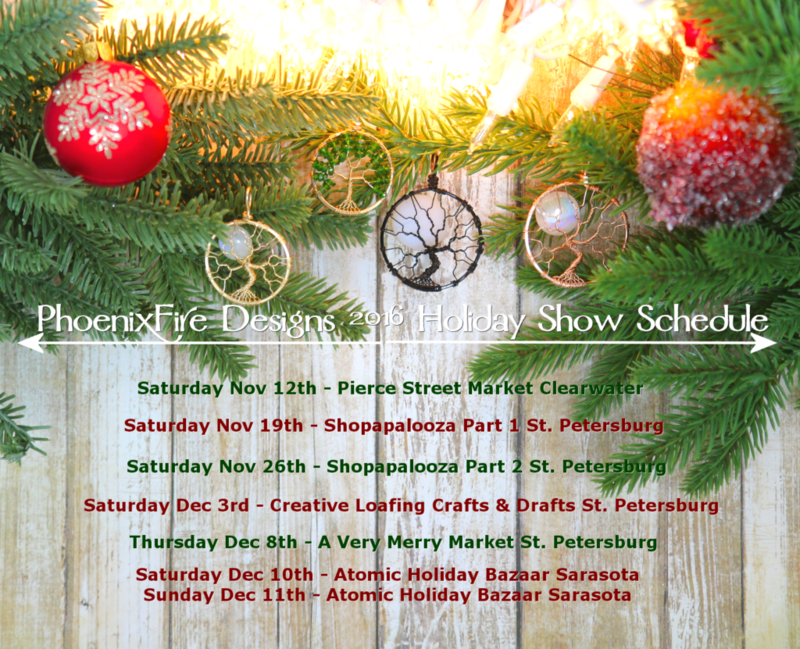 ), why not come out and see PhoenixFire Designs at one of our local markets? You can not only get to see and touch everything in person, but we have show-exclusive items such as our wire wrapped rings, recycled vintage sari silk wrap bracelets, fun, miniature christmas ornament earrings and more. It’s the perfect way to find unique gifts for her on your holiday shopping list while supporting handmade and, shopping small and handmade! Oh the places we’ll be this holiday season! Shop our wide selection of handmade jewelry as well as unique, seasonal favorites to get something special for everyone on your Christmas list! Shop small this year and support a handmade holiday! Not local to Tampa Bay? No worries! PhoenixFire Designs etsy shop ships anywhere in the world the US Postal Service does! Check out our large selection of the finest, handcrafted, wire wrapped jewelry including our signature tree of life pendants, full moon tree necklaces, meaningful Mother’s Jewelry and Family Birthstone Necklaces, handmade gemstone earrings, and seasonal favorites such as my famous miniature yarn ball ornaments – a perfect gift for knitters and crafters! Be sure to shop early for the best selection and to ensure Christmas delivery.